One of the downsides of having Melodifestivalen happen during February/March each year is the upspike in likelihood that contestants will fall sick with a cold when they need to be in their peak health. 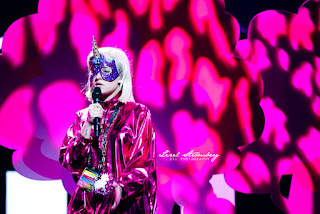 Such was the case for Norwegian artist Kamferdrops, who was fighting off a cold during her semi-final. Despite having a pleasant pop song that infused both contemporary and retro elements, and an interesting staging concept involving backing dancers all disguised to look like her, the live vocals and overall energy simply weren't up to parr. Had she been in better health, perhaps she would have fared better in the voting results.